This is a serious wine. It’s got so much going on that at first you’re worried that you’ll never find anything that perfectly fit, and then when you relax about that you wonder if you’ll ever narrow down the options. Well, I say worry, I’m never too worried about the amounts of food I can eat with anything! The fact that it will be such a bold, spicy wine, usually with plenty of finish (that flavour lasting in your mouth for a while) makes me think very quickly about stews. Or anything with that kind of thing as part of the recipe. I remember having a steak and kidney suet pudding the other day. It may well have knocked a good couple of weeks off my life expectancy, but me oh my, it was lovely. It was big, but maybe the suet pudding was a bit too sweet. That’s why I’m going for another old English classic winter dish. 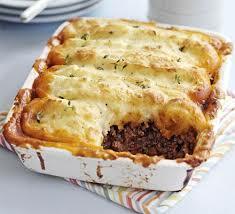 Cottage Pie! I’m going to use beef mince instead of stewing steak, just so I can get a good amount of fat in the base. Make sure the gravy is well seasoned (match up the pepper spice), and don’t be afraid to stick that cream in the mash on top. You want it lush, and you want it warming. Job done!